I sign up for every newsletter I come across, at least since joining the email marketing industry. I enjoy seeing who's doing what, judging the good and bad and seeing who is being innovative. Sometimes it's something as easy as executing best practices to a T that impresses me the most. B&H Photo is one of the topmost respected professional photography businesses around. I purchased my SLR with them about three years ago and had a great experience with them. It has been that long since I had any interaction with the brand. That is, until yesterday. See, B&H didn't just assume that since I'd purchased something with them in the past that I'd want to receive their newsletter. 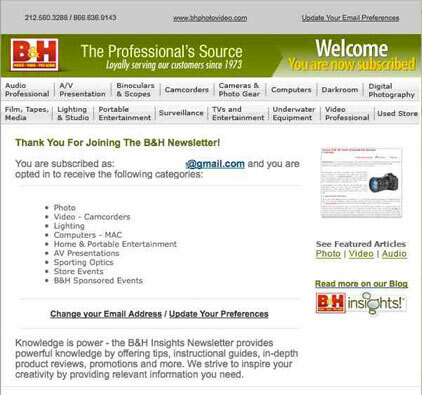 Instead, B&H sent an email telling me they valued my patronage and wanted to send me their newsletter. Also, so I'd know what I was getting myself into, they attached an image of a previous newsletter. Not only did I get to see a preview of their email newsletters, it was broken down by section. It pointed out the Subject, New Announcements, the Images, Categories, etc. How could you resist signing up for their newsletters when they were proving to you how great they would be? The sign up process was super easy to follow. 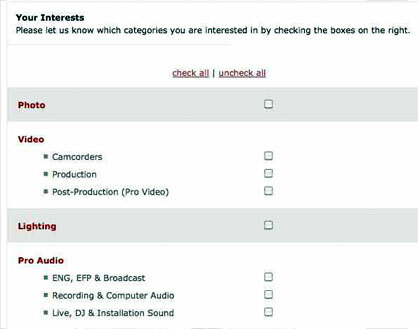 Not only that, but they allowed me to select the topics I had an interest in among their Photo, Video, Lighting, Pro Audio and other departments. That way I could always receive targeted messages about products that interested me. Immediately after subscribing, I received a welcome email. It wasn't a generic one either. It showed me exactly the subjects I had signed up for. It matched all the branding from the previous email. Also, there was an easy option to update my preferences if I decided I wasn't satisfied with the topics I had selected. First, don't assume permission. I really appreciated B&H reaching out to me in that manner. I haven't needed new camera equipment recently, but I always enjoy looking. Now I'm happily subscribed to their newsletter. Second, tell potential subscribers what to expect from your communications. 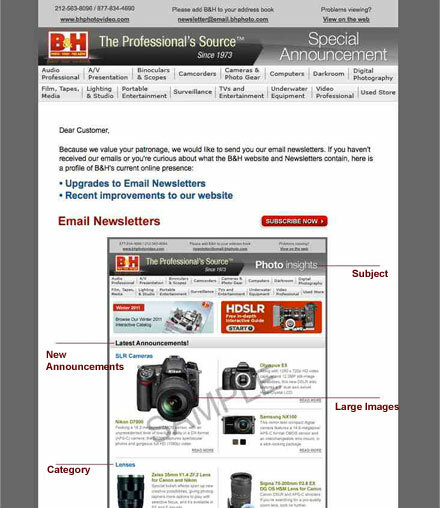 I even know what the newsletters will look like, thanks to B&H's excellent opt-in email request. Third, allow your subscribers to dictate the types of messages they'd like to receive. I won't be receiving mass-produced emails that are of no interest to me. Lastly, make it easy for your subscribers to change their preferences at any time, whether that be to unsubscribe, receive communications on other subjects, or even change what address email is delivered to.